RUGBY WORLD: What will you miss about Gloucester? Dave Attwood: The Shed. I’m yet to encounter fans as vocal as Gloucester’s. RW: What’s exciting about moving to Bath? DA: The fresh start. It’s a squad in transition and I’m looking forward to helping to forge the direction of the club with new team-mates. 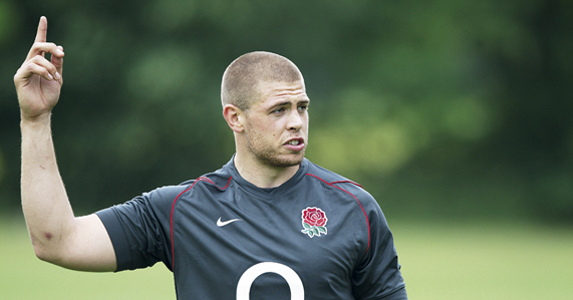 RW: Who are the jokers with England? DA: Haskell’s the king of the jokers in the senior squad. But the Saxons are a bit younger and not as confident. I’ve been impressed with Tom Johnson’s banter, though, and Billy Twelvetrees and Jordan Turner-Hall are jokers. DA: My new bed. It’s a super-king size with a supportive, deep-filled mattress. The bath tub, a big Victorian roll-top which wasn’t expensive but took ages to find. And my dog, Alfie, a black labrador. RW: Have you got any good nicknames? DA: I had the Quaffer at Bristol because I was partial to a drop of wine. But at Gloucester just Atters, or Big Dave. DA: I’m scared of heights, which is odd for a tall man, although I’ve found out quite a lot of tall people are the same. DA: It annoys me when you give someone a lift and they leave rubbish in the back of your car, like Will James! DA: Super speed. I’m trying to do up my new house in Bath before I have to be out of my flat. I’ve got no idea how I’m going to get it all done! DA: James Corden. 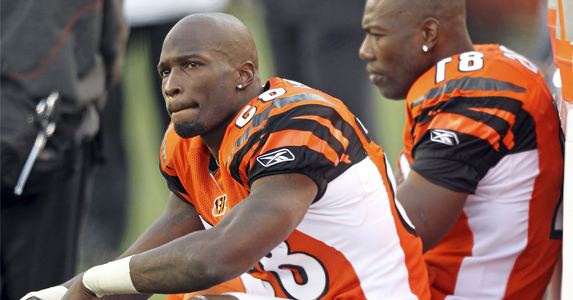 Or the American Footballer Chad Ochocinco (left), because some of their banter is a million miles removed from what we’ve got here. I’d like to be a fly on the wall with Dave Flatman and him! RW: Top three dinner party guests? DA: Pippa Middleton, Ryan Giggs and Ricky Gervais, because he’d have no qualms about discussing any of the things we’d like to discuss at dinner! DA: Power tools and collar stiffeners. I hate having an untidy collar. DA: I had one last year. I was in a spa for a week on a beach in St Lucia. I did absolutely nothing! RW: What’s your favourite cuisine? DA: Correcting other people’s grammar. I’m no saint myself, but I still correct others! DA: It depends on the time of year. I’ve played a lot of Call of Duty, but not for a few months. At the minute I’m having a whale of a time sanding down a coal chute! RW: What three things would you take to a desert island? DA: Plenty of reading material. Fresh towels, because it’s annoying when your towel gets sandy. And a lilo. DA: I like physical challenges, and I’d like to climb Kilimanjaro. I cycled round Iceland with Bristol, and the year before we kayaked the Norwegian fjords. RW: Who have been your best and worst room-mates? DA: The best was Alex Brown because he’s clean and tidy. I’m not great because I snore! And maybe Paulie (Doran-Jones) because you have to put up with his brutal banter. DA: As someone who’s practical and useful. And as someone who achieved things, both in a rugby sense and wider scheme of things.